Turning Point has adopted a roadway! Help us keep our stretch of road clean. It would be very appreciated. 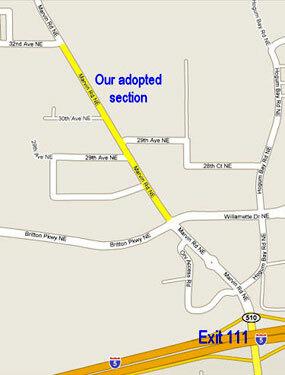 Adopt-A-Roadway - Helping the Community stay Beautiful! Help keep the road clean for the community. Why not take a turn and volunteer to help with one of the scheduled clean ups? If you'd like to help please use this form. Also, please download the contract and fill it out. If your under age 18 (volunteers must be at least 15 years of age) please also have a parent/guardian sign this form. Thank you. We have hard hats, safety vests, litter-pickers and garbage bags for each volunteer to use. Volunteers, please bring your own gloves. 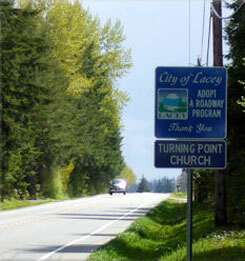 Your Service along with The City of Lacey — Shaping Our Community Together.